I suppose the title should conclude with “in the US passenger car market.” Who knows how many industries Honda is really into, anyway? To find out, you could start with Honda.com, which lists cars (Honda and Acura are separate), power sports, racing, power equipment, marine, engines, and the HondaJet. I suppose this sort of diversification is why they can afford not to care about appealing to the niche US car enthusiast market. I just hate that their cars used to be great and now are just bloated, underpowered, understyled attempts to please the worst division of the car-buying public: the people who just don’t care about driving. Honda updated its Civic in 1996 to a body style immortalized by the “The Fast and the Furious” and still seen on the road today. It was inexpensive, it was practical, you never tired of looking at it, the gearbox was a joy, and while there wasn’t much power in stock form, it was absolutely a joy to drive and additional power could be had for cheap in the aftermarket. In 1997, Honda released a new Prelude that made 195hp and 190 lb-ft of torque from a 2.2L four-cylinder and featured an available Active Torque Transfer System (ATTS) in the high-end SH trim, which was only available with a 5-speed manual. If that’s not catering to the enthusiast, I don’t know what is. In 1998, Honda restyled the Accord, making it larger than the previous model but managing to keep the fun-to-drive feel. The V6 got the VTEC valve timing and lift technology, upping its output by 30hp over the previous V6 to 200, with 195 lb-ft of torque available at 4700rpm. Mileage was a respectable 21/28mpg with a FOUR-speed torque converter automatic transmission (imagine if it could be retuned for a modern dual-clutch with more gears). Reviews were universally positive, the Accord re-established itself on the Car & Driver 10 Best list, and Honda sold zillions of them to proud, happy customers. A few years later, armed with momentum and profits from these rapid-fire successes, Honda started kicking out absolutely monumental Acuras. In 2001, the MDX sport-ute made its first appearance,and its trophy case filled rapidly with The North American Truck of the Year Award, the Car & Driver “Best Luxury SUV” award, and the Motor Trend “Sport Utility of the Year” award. In 2002, the RSX arrived, dominated comparison tests, succeeded on the racetrack, and to this day still must be considered a prime choice if you want a fast front-drive two-door coupe/hatchback. The TSX appeared in 2004, and crushed its contemporaries the Volvo S40, Audi A4 1.8T, and Subaru Legacy 2.5GT in a Car & Driver comparison test. Patrick Bedard said of the TSX, “If this were a puppy, it would be wagging its tail from the shoulders on back, so happy, so eager to play. This one topped our fun-to-drive rating and the gotta-have-it factor. No doubts, no reservations. This is a keeper.” It also had, in my opinion, one of the best manual gearboxes ever crafted by mankind–even better than the one in the RSX. Lastly, the halo car for the brand, the NSX (may it and Aryton Senna rest in peace), received a freshening for 2002 wherein it lost its so-80′s pop-up headlights, but kept its first-ever-in-a-production-car super-lightweight all-aluminum monocoque construction and its screaming mid-mounted V6. It was a beautiful time to be a Honda/Acura lover. 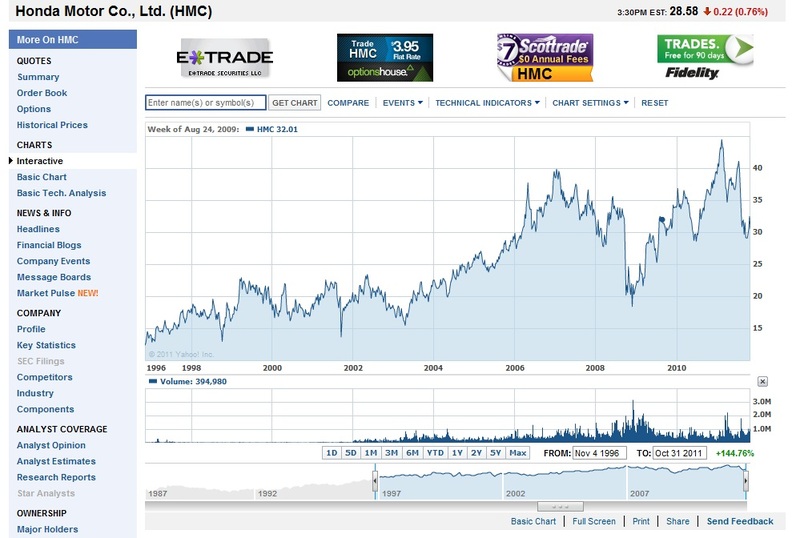 Then, right there around where the stock price stopped its steady rise in early 2007, the love stopped too. Coincidence? I don’t think so. Honda killed the NSX and RSX, then restyled the TSX to make it unattractive and removed all the puppylike fun. They said the boy-racer 2006 Civic Si would satisfy the disenfranchised RSX customers–it didn’t, since it wasn’t a hatchback, looked futuristic in a stupid way, and the interior was no longer “special and unique” but “completely mundane.” They said they would focus their sports car efforts on a model year 2010 replacement for the NSX, then cancelled the project. They built the hideously ugly Ridgeline, which only escaped ridicule because “it’s a Honda” (the same could be said for the Pilot, especially the second-gen Pilot; yo Honda, practical does not equal desirable–see “Pontiac Aztek”). They killed the S2000. They haven’t made any significant changes to the RL in nearly a decade, the second-gen TL was too edgily designed to be a sales success, the CR-Z is just too slow and heavy to capitalize on the well of goodwill left over from the CRX, and the ZDX…ugh, don’t even get me started on the ZDX. Honda, get back to doing what you did in the late 90′s and early 2000′s. Make eye-pleasing, simple, light, inexpensive cars that will run their high-revving engines forever. Make cars with great suspension tuning and heavenly manual gearboxes. Make cars that are interesting and inspire the imagination. Make cars that people will want to drive, no just live with. And seriously, give us back our NSX.